• Free one hour slope pass or a free lesson if you participate in Snozone Disability Snowsports for every member you refer. The more Members you refer, the less you pay! You need never pay as you go again! • 50% off every slope session and group activity May – September (25% off every slope session, lesson and activity October – April). 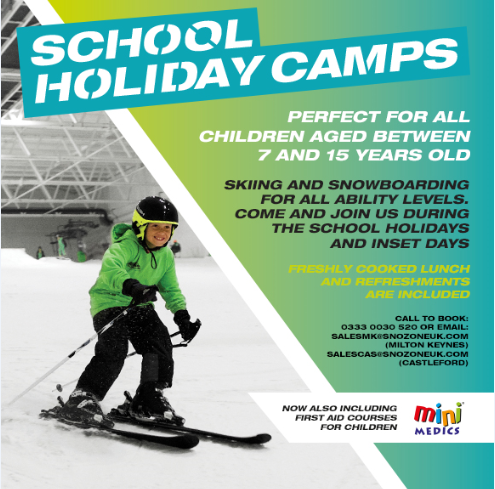 • Priority booking for our market leading SnoAcademy and School Holiday Camps, plus 15% off the ticket price of both. • Two free 1 hour recreational passes when you join (worth £47.98 off peak, £61.98 peak) or a free lesson upon joining if you participate in Snozone Disability Snowsports. • Free skiing or snowboarding every Tuesday 4pm-5pm (excluding Christmas and February half term holidays). • A free 1 hour recreational pass on your birthday. • 15% off all full-priced shop merchandise and in the restaurant (excluding alcohol & confectionary). • 15% off children’s parties. • 15% off private lessons. 20% off if this is an adaptive lesson! • 20% off private lessons at Skizone Basingstoke. • 20% off meeting room hire. • Exclusive Member’s only events and Facebook Member’s VIP Group with additional exclusive rewards throughout the year. • Free ski/ snowboard carriage when booking trips with Crystal Ski Holidays (only applicable when booking at the Crystal store within the centre, not applicable when booking online or via Crystals contact centre. Other terms & conditions apply). • Free wax and edge line service every 30 days conducted at Castleford and Milton Keynes. • Free parking at Milton Keynes when purchasing a lesson, recreational pass or coaching session ticket. • A chance to win a free snowsports holiday every year! Join the revolution and enjoy snowsports all year round with a simple one off payment with no contract and membership options for individuals and families (see below for prices). For more information please email sales.mk@snozoneuk.com (Milton Keynes) or sales.cas@snozoneuk.com(Castleford) with your name, telephone number and details of your enquiry. We will contact you within 48 hours. *Based on a family membership and average usage throughout the year. Terms and conditions of membership apply. “I am 81 and I learnt to ski over 40 years ago and switched to Snowboarding 30 years ago when we had to learn in Ski Boots. I used to go regularly to France but as I have got older I can only do a couple of hours a day so the Snozone is ideal as I can come along do an hour at a time. I don’t have to worry about the weather or conditions and I can have still have fun doing the sport I love. I have been coming to the Snozone for a number of years and the membership saves me money as well. The staff are really friendly and helpful. I would recommend the Snozone as a great place to learn and practice and to make friends.” Snozone Member Don Everett. “Snozone really sets you up for getting out on a mountain, all year round and enables many disabled people to ski autonomously.” Snozone Members Ian and Tony (pictured above). “I became a Snozone Member 3 years ago and have gone from being a relatively novice skier to now being instructor qualified due to the training and coaching that I have had at Snozone. The membership savings on the coaching alone has paid for my membership 3 or 4 times over.” Snozone Member Sue. Snozone Member and holiday winner Victoria. Victoria (above) was our 2017/18 Member’s holiday to Italy competition winner. She told us that she is “very excited and really looking forward to an amazing experience”.